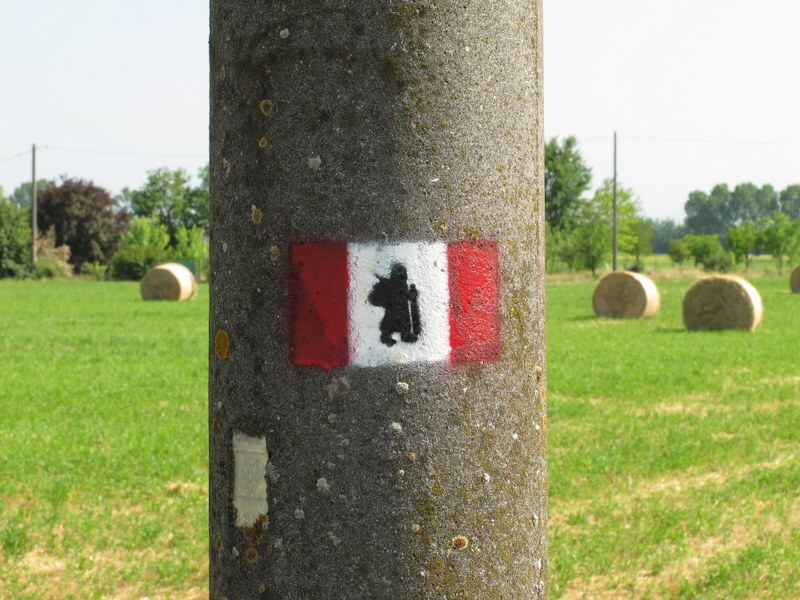 The Via Francigena is the ancient pilgrim route from Canterbury to Rome and is far less touristy and busy than the famous Camino de Santiago. 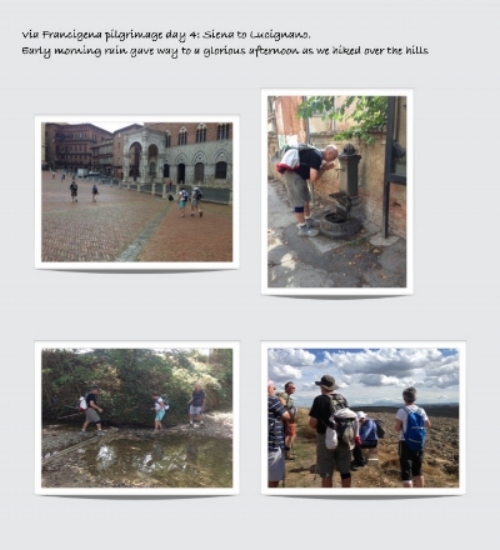 Our pilgrimage takes us through the beautiful landscape of Tuscany, from mediaeval San Gimignano to Montalcino. It offers glorious scenery, fabulous wines, ancient frescoes, hill top mediaeval villages, and a true sense of doing something different. The ancient route was supposedly first travelled by the Archbishop of Canterbury, Sigeric, in the year 990, as he travelled between Rome and Canterbury. Follow in the footsteps of the pilgrims who over the centuries have travelled across Europe and down the Italian peninsula. Penelope and Kim are experienced leaders of fully guided pilgrimages for up to 12 people. If you would like to get a group together for your own personal group pilgrimage, we can discuss dates and prices. Please contact us for details. Enjoy days of glorious walking, daily times of worship, meditations and spiritual ‘exercises’ to help you to focus on what the Lord might want to say to you. Sleep in historic places; gaze at ancient frescoes; eat gelato; swim in a Roman-built pool. 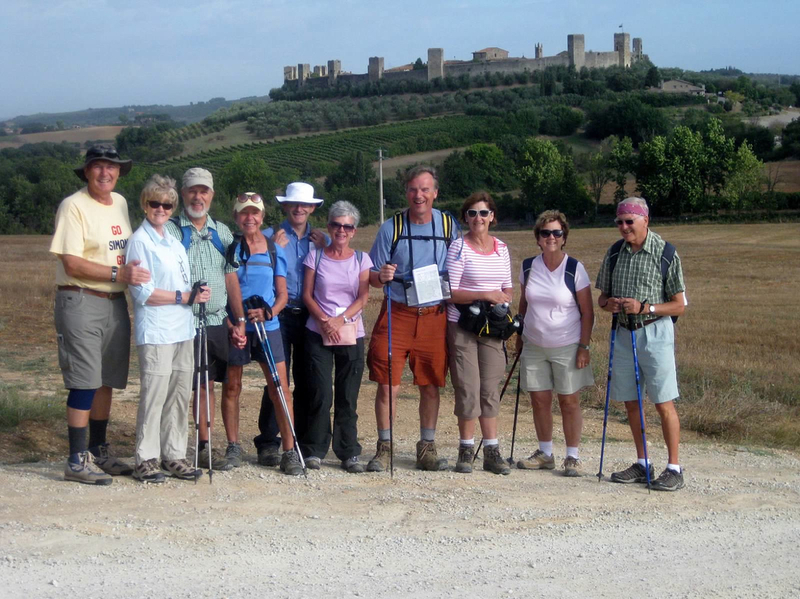 This is a spectacular walk and includes visits to some beautiful Tuscan towns and cities, including San Gimignano and Siena. 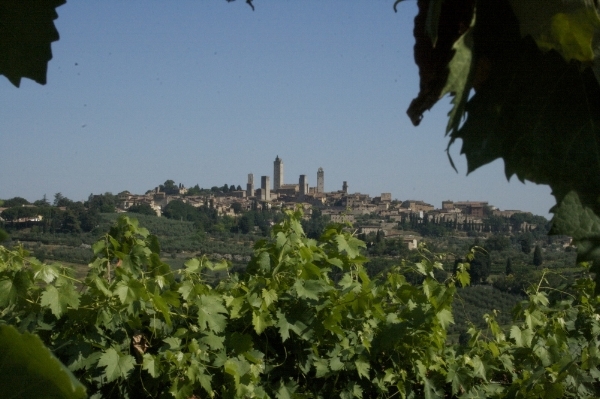 Walking through the vineyards and olive groves of central Tuscany, from San Gimignano to Montalcino, through walled hill top mediaeval villages, following the ancient pilgrim route. Day One: Arrive in San Gimignano. Spend the evening exploring the ‘Manhattan skyline’ of ancient towers. old upper town and lower 'new' town. 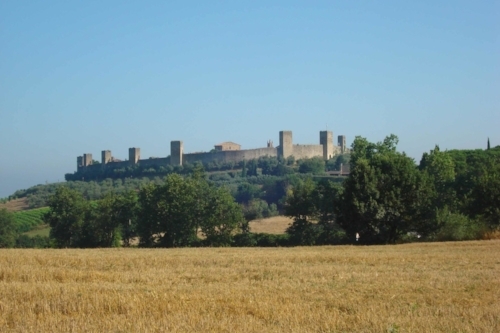 past a wonderful open air Roman swimming pool, to ascend to the hilltop town surrounded by 14 mediaeval watchtowers. great mediaeval city in Europe – where they serve more fabulous gelato! Day Five: Walk to Lucignano (14.5 miles) Tracks wind across low open hills through the Crete region. Brunello wine (Italy’s most expensive red wine!) 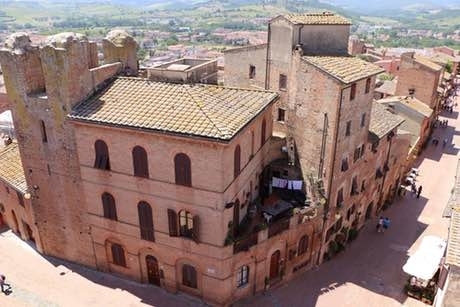 to the wonderful hilltop town of Montalcino. Day Eight: Depart for flights home. suggestions and help to get fit before you come! You will also need to buy your own lunch each day, either at cafes along the route or in the local shops. This is a slightly tougher walk than Part 1, but still within the range of anyone who is reasonably fit. (doing Penelope's recommended preparations for the walk is essential!) 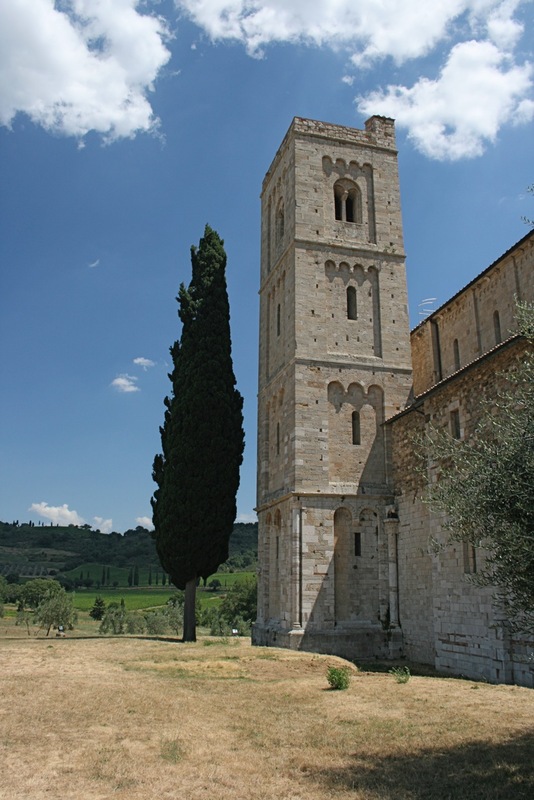 It goes through some wilder country than Part 1, but also goes past the stunningly beautiful abbey at San Antimo, parts of which date from the 4th century. If you like to get right away from it all, and if you like a challenge and an adventure, this is for you! 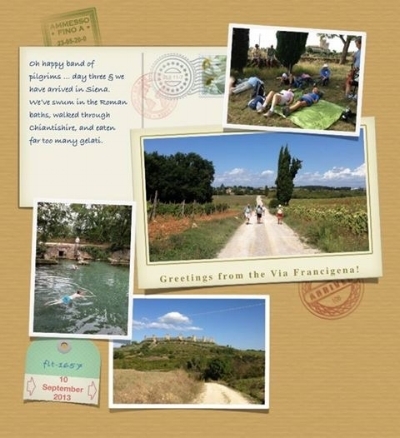 If you would like to get a group together to do this part of the Via Francigena with us for your own personal group pilgrimage, we can discuss dates and prices. Please contact us for details. We do not accept any liability for any loss or injury however caused. We recommend that you take out appropriate holiday insurance cover against illness, injury, loss or damage to luggage whilst on holiday. This insurance should also cover the possibility of your having to cancel your holiday for whatever reason. We wish to remind you that (except in the case of their negligence or wilful default) neither the leaders, the tour operators nor the venues accept any liability for any death, injury to persons, illness or property damage of any kind occurring during the week’s Walk. For centuries, Christians have walked to special places, to take time to be with God and allow God the time and space to work in their lives. -It is a setting aside of one’s normal routine, and taking time to reflect on what the Lord is saying, with the rhythm of walking giving mental and spiritual refreshment. - it is a desire to spend quality time with God in a new way. Most of us, most of the time, long to get away from it all: away from the rush and the stress and the busy-ness of our everyday lives. Time away to spend time with the Lord. Time to get fitter and leaner in every way. AND in a beautiful and special place. 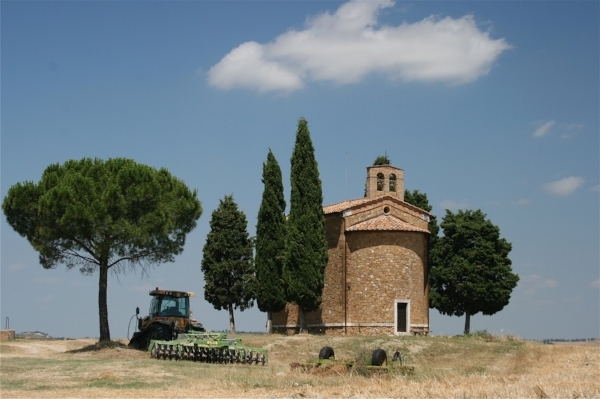 A pilgrimage is a vacation with a difference, and many people are now discovering that walking on ancient pathways, surrounded by beauty, in peaceful quiet places, helps you get into a rhythm that often makes it easier to hear from God, to shed the burdens, to rediscover who you are and who you are meant to be.